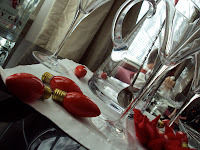 Happy new year, blog readers! 2011 has started off as a snowy year on Long Island, and lots of indoor time combined with the fresh-start feeling of a new year and a new decade has inspired me to make some design resolutions at home. With the guests gone and my holiday décor stored away, I’m taking inventory. A great design exercise is to walk through your house with a notebook and a camera. Looking at your spaces in photographs may call attention to areas you often overlook. Observe and note any necessary repairs, like chipped paint, but also reconsider any areas that seem tired or outdated. In many cases, these problem areas may be an easy fix that breathe new life into your space. I have planned some updates in my own well-used family room. I’m going to repaint and order a new carpet due to ordinary wear and tear. But I’ve also rethought the room’s dining area. By switching out a set of botanical prints I’ve owned for years with an incredible collection of framed intaglios I found, the corner has totally changed its identity. The two Parsons chairs around my Lucite table also got a redo – in a great navy fabric with an Asian motif. 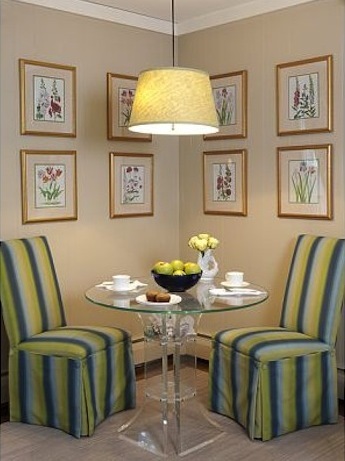 The dining area looks completely different with the art and fabric, despite the same wall color, furniture, and light fixture. 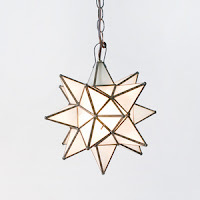 I am considering these light fixtures for the space from a favorite vendor. Swapping out your accessories can also change the look of your space without any serious work or commitment, especially after the holiday decorations have come down and you feel that your home needs something special! There are many more at home projects I’ll share as the months go on. 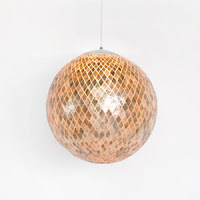 What are some of your 2011 design resolutions? 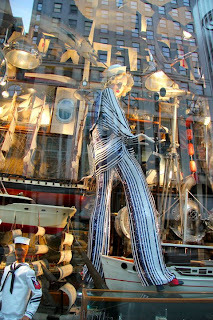 One of my favorite holiday pastimes is heading into New York City early on a weekend morning, before the crowds arrive, to see the holiday windows of the Fifth Avenue department stores. It’s become a tradition in my family; we’ll wake up early, stop for coffee, and drive into Manhattan before most New Yorkers are even awake. Besides being a festive outing, the artistry and creativity of the windows is always inspiring to me as a designer. This year the Henri Bendel windows featured some incredible scenes – ranging from an interpretation of the Nutcracker to amazing travelogues. If you’re in the New York City area, it’s worth a visit! And you may want to finish your window watching with breakfast at one of my favorite breakfast restaurants in all of Manhattan – Norma’s at Le Parker Meridien. 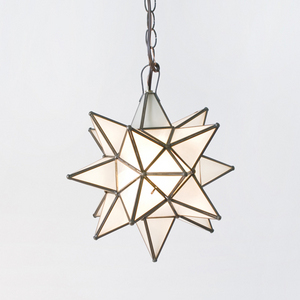 No matter what city you live in, there’s so much great design to experience during the holidays! I love winter holiday decorating. Every year after Thanksgiving, I transform my house in anticipation of Christmas. I rely on many of the traditional decorations special to my family from over the years: heirloom ornaments, fresh greens, wreaths on the windows (painstakingly hung by my husband), and a collection of special Christmas children’s books that belong to my now grown children. 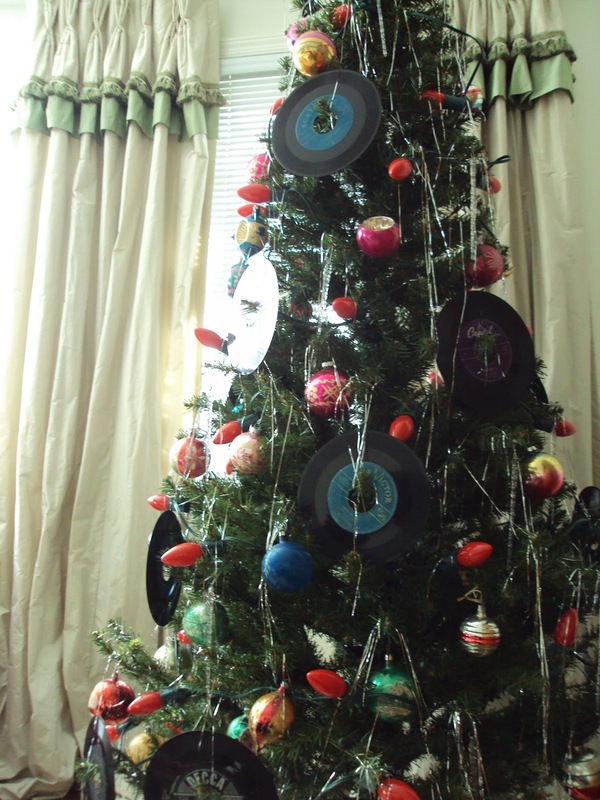 But as traditional as Christmas is, I always love to mix it up! Last year, I was asked by Newsday to design a room around a holiday theme. After much thinking and scouting, I decided on a fun but still nostalgic theme I knew my family would enjoy throughout the season and on Christmas morning: 50s! 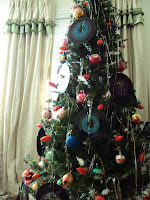 Old forty-five records found in my mother’s attic in South Georgia became the ornaments for my dining room tree, which was lit by big, red retro bulbs. Old-fashioned candy in apothecary jars evoked “visions of sugarplums,” and I adorned wrapped packages with dot candy ribbon. A “Mad-Men” style martini bar brought the look to life and I found pink Cadillac ornaments that were perfect at each place setting. Turquoise and pink were modern substitutes for the more predictable green and red. 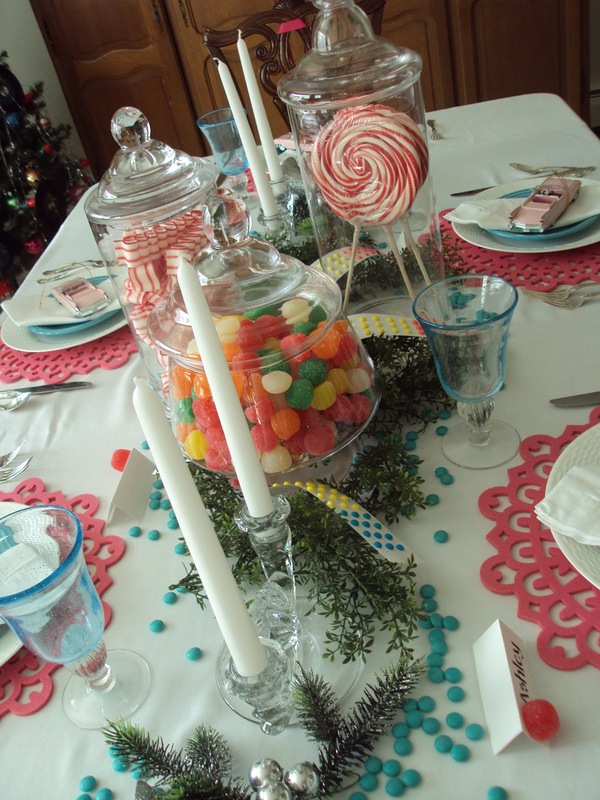 Don’t be afraid to try new color combinations and explore fun themes in your holiday decorating this year! I’d love to hear about your plans for holiday decorating. Packing a Punch . . . in the Powder Room! A guest bathroom or powder room present a great opportunity to really have some design fun. In a master bath that you’ll use day in and day out, you won’t want to take any big color risks that you’ll soon tire of. But for a guest bathroom, you can afford to be playful. 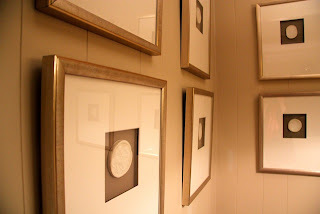 I like a powder room to feel like a dramatic piece of jewelry, especially if it’s only used for guests. I choose beautiful jewel tones in paint or paper that I wouldn’t use anywhere else to make this small room feel unexpected and rich, elegant and special. A unique black-lacquered cabinet and interesting art adds to the drama of a powder room. 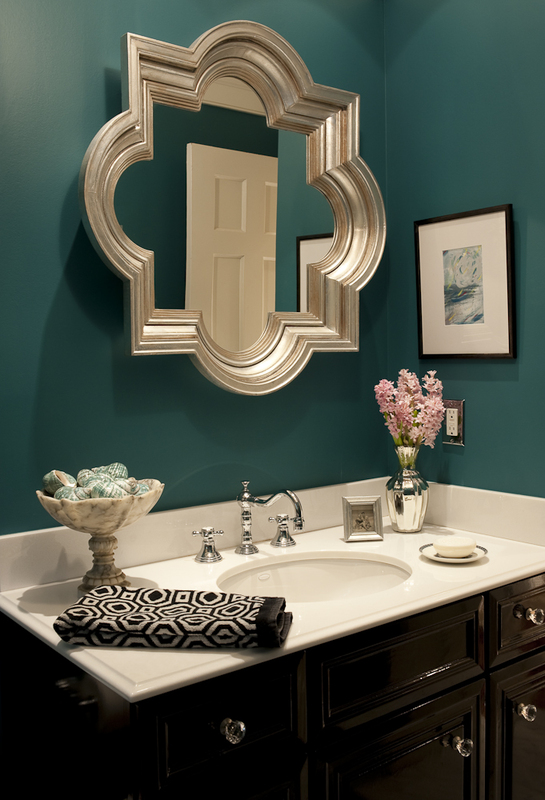 And no jewel box would be complete with some sparkle–a jewel-like chandelier on the ceiling, or a really special mirror like this one I chose to complement the rich turquoise paint in my powder room. Special accessories make the room feel like a treasure. This holiday season, I am teaming up with the talented Patrick Ward of Outdoor Environments to “deck” my home and open up my doors for the 5th annual North Shore Holiday House “Deck the Halls” House Tour. The tour will be held on Thursday, December 2nd. Tickets are available at the “Deck the Halls” House Tour Web site. I am so happy to support this wonderful cause! One of the most overlooked–or maybe under-looked–areas in design is the ceiling. Adding an unexpected color or texture to the ceiling is a wonderful way to really add “wow” to a room. Last year on the New York Junior League Spring House Tour, one of my favorite featured homes was a Grammercy Park townhouse. It had a kitchen that seemed a bit ordinary–until I looked up! 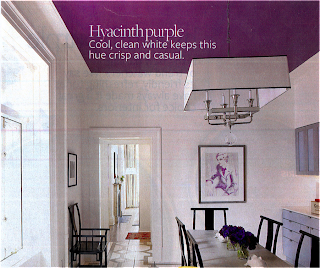 The ceiling was an incredible shade of hyacinth purple. Features in this room balanced its bold color, like a large scale geometric design painted on the wood floor, and art that subtly incorporated the vibrant color, so it wasn’t entirely unexpected. Since the tour, I’ve seen this very room featured in House Beautiful and Good Housekeeping magazines! Recently, in re-designing my own living room, I also took full advantage of the ceiling real estate by papering the ceiling in a fantastic fuchsia vinyl. With a tiled horsehair effect, it’s also a real “wow,” especially with the show-stopping light fixture I chose. The walls and floor are soothing neutrals that won’t compete with the ceiling, but the color is called out and accented by the fabric and accessories in the room. Have you gotten your fall sweaters out? These adorable dogs have, and they’re decked out for autumn, just like your child’s room could be. 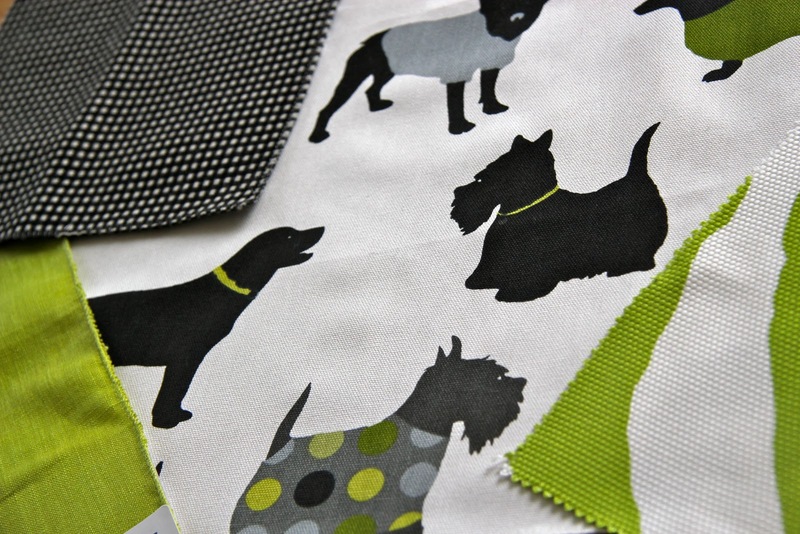 I’m loving this fun fabric for fall. 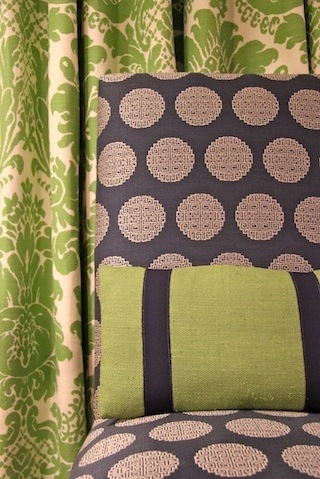 Here, I’ve paired it with some complimentary fabrics for a perfectly fantastic child’s room. The bright green of the dogs’ sweaters is picked up in the bright green linen fabric which would be wonderful in a window treatment. The wonderful geometric and scale of the black and white would make an amazing chair. 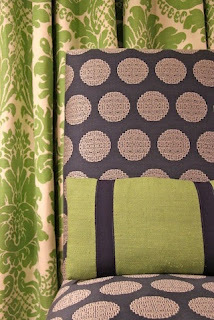 And a fun tape always adds a level of details that increases the impact of any upholstered piece. Welcome fall! Welcome to my blog! 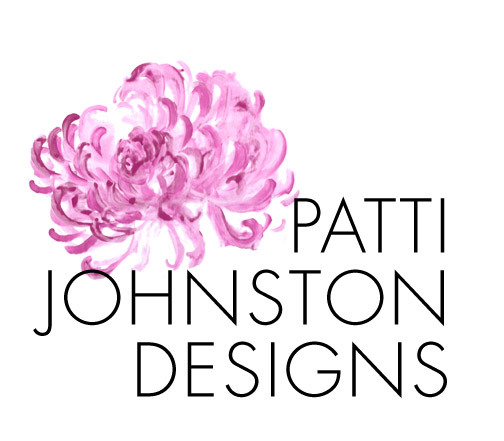 Here at Patti Johnston Designs, I am always inspired. Whether it is by industry trends, fashion, travel, or even visiting an impeccably designed restaurant or hotel, my designs are always influenced by my everyday experiences in the field and beyond. This blog is a place where I’ll continually share these inspirations with you. Check back weekly for features like color forecasting, tips, design reviews, upcoming events, and some of my favorite finds in fabric and furniture. And, always feel free to contact me. Thanks for visiting!